Welcome to Egoli Place of Gold, your bespoke goldsmiths and personalised jewellery designers in Perth. 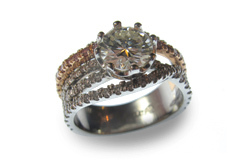 At Egoli Place of Gold we don’t just make and sell personalised jewellery, we create heirlooms. We know that acquiring a piece of jewellery is an intensely emotional affair. When we inherit jewellery, it comes to us carrying the emotional freight of our feelings for, and memories of the person who bequeathed it to us. When we commission new custom jewellery, we want to know that one day, perhaps many years from now, we may bequeath it to someone for whom we have similar feelings. Egoli Place of Gold is in many ways a traditional craft shop. Our goldsmiths and gemmologists are not hidden away, but work right there in front of our visitors. That’s because we need to involve our customers at every stage of the process. When you enquire about commissioning a new piece, or about altering or repairing an old one, you will participate in the design process right from the choice of materials and stones, through to discussions about design and execution. Our customers can watch work being performed and see, using our gemmologists’ microscopes, how their own stones are unique. This collaborative approach to designing handmade jewellery is so effective that we even offer a free remake policy, in case the result doesn’t match your expectations. Our team is the heart of our business. Headed by Tony Whitehorn, a goldsmith of over thirty years’ standing who has trained 9 apprentices, two of whom still work in the family business. Egoli’s team includes Nicki Whitehorn – a gemmologist able to advise on choice of stones, and to perform jewellery valuations. Since all our work is performed on the Egoli premises, the risk of loss or theft of the jewellery we handle is greatly reduced. Come in, meet the team at Egoli and discuss your ideas and needs. Or just send us an enquiry here.